The Gospel for the Nineteenth Sunday in Ordinary Time is a familiar story: Peter walks on water. You’re in a small boat on a large lake, working hard to get across. The wind is against you, you’re being battered by waves, and you spend the entire night straining to make progress. When morning comes, you slump over your oars, discouraged, exhausted and seasick. 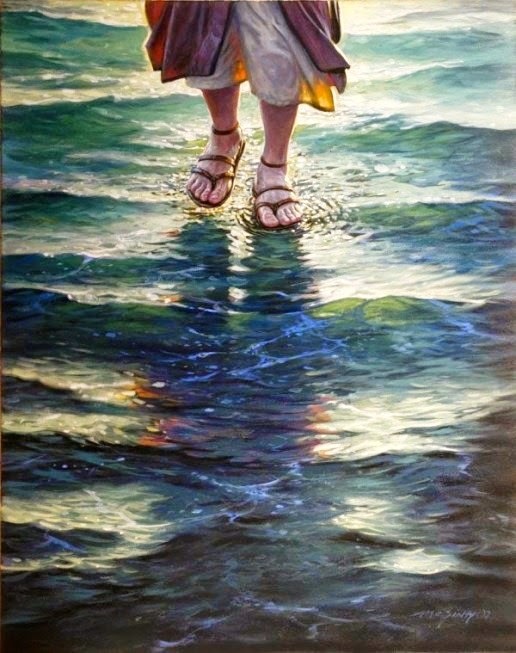 Suddenly Jesus appears, walking on the water. You’re shocked, surprised, stunned ... even terrified. Is it a hallucination? A ghost? A god? Certainly nothing human can walk on water. This paranormal behavior is way over the top. But then Jesus says, “Take heart, it is I; do not be afraid”. Jesus invites you to step into this blue ocean with him, and so you carefully put a foot out. You begin to make your way across the waves, but the wind suddenly whips up and startles you, and you begin to sink. Jesus reaches out, catches you, and chides you gently, “You of little faith, why did you doubt? To succeed you have to trust the power of God.